Our next installment of Teaching Evolution for this spring concerns Sewall Wright. His contributions were wide-ranging, but he is most noted for his integration of population structure (population size, migration) and selection into what he called the “shifting balance” theory. In this theory, genetic drift, migration, and selection interact to produce what he saw as the most favorable conditions for evolutionary advance. The reading is a brief precis of his much longer 1931 paper in Genetics, but in many ways was more influential, as it exposed a wider audience to his ideas. Modern appreciations of the shifting balance theory are given by Nick Barton (2016) and Norm Johnson (2008). Sewall Wright, with guinea pig. Sewall Wright (1889-1988) was, along with R.A. Fisher and J.B.S. Haldane, one of the founders of theoretical population genetics, which synthesized Mendelian inheritance with Darwinian natural selection, thus laying the foundations of modern evolutionary biology. His classic paper “Evolution in Mendelian Populations” (Genetics, 1931) laid out his synthesis, and led to his election to the National Academy of Sciences while still a young man. Like Darwin, Wright studied carefully the work of animal breeders, and this strongly influenced his ideas on evolution, which he called the “shifting balance” theory. Although sometimes caricatured as a theory emphasizing random genetic drift, Wright stressed the importance of the interaction of drift, selection, and migration in adaptive evolution. Wright strongly influenced Dobzhansky, and he coauthored five papers in the latter’s “Genetics of Natural Populations” series. Beginning with his graduate studies at Harvard, Wright’s organism of choice for genetic studies throughout his career, which ended with a very productive 33 year retirement at the University of Wisconsin, was the guinea pig (note what is in his left hand in the photo). He is author of the monumental four volume Evolution and the Genetics of Populations (1968-1978). William Provine has edited a collection of Wright’s most important papers, Evolution: Selected Papers (1986), and written an insightful and analytic biography, Sewall Wright and Evolutionary Biology (1986). Wright, S. 1932. The role of mutation, inbreeding, crossbreeding, and selection in evolution. Proceedings of the Sixth International Congress of Genetics 1:356-366. 1. In this paper, Wright introduces the idea of a fitness surface or adaptive ‘landscape’ (see esp. Fig. 2). What do the x and y axes (the two dimensions of the ‘map’ on the paper) represent? What does the ‘altitude’ of a point on the landscape represent? What does a peak in the landscape represent? What does a valley in the landscape represent? 2. In one sentence in the first half of the paper, Wright succinctly states the Hardy-Weinberg equilibrium for allele frequencies, and its cause. Find and quote the sentence. Show that Wright understands the H-W principle. 3. Why is it difficult for a species to evolve across a valley from one peak to another if selection is the only evolutionary force? How does this lead Wright to argue for the importance of drift (inbreeding) and migration (crossbreeding), as well as selection, in allowing species to reach the highest adaptive peaks? Jerry addendum: While Wright’s theory was influential, and was incorporated by Theodosius Dobzhansky into his view of the Modern Evolutionary Synthesis (see his book Genetics and the Origin of Species), I find the theory deeply flawed. With two colleagues, Nick Barton and Michael Turelli, I wrote a long critique of that theory in 1997. Our paper was in turn criticized in two papers, one by Mike Wade and Charles Goodnight, and the other by Steven Peck et al. We then rebutted these papers in another Evolution paper in 2000. All four references and links are below. In my biased estimation, our critique did stem the tide of enthusiasm for Wright’s theory; in fact, Wright’s colleague James Crow at Madison said that our paper prompted him to stop accepting that theory. I’m not sure whether Greg mentions the critiques and attempted rebuttals in his lecture, but I’m putting them here for readers. Coyne, J. A., N. H. Barton, and M. Turelli. 1997. A critique of Sewall Wright’s shifting balance theory of evolution. Evolution 51:643-671. Wade, M. and C. J. Goodnight. 1998. The theories of Fisher and Wright in the context of metapopulations: when nature does many small experiments. Evolution 52:1537–1553. Peck, S. L., S. P. Ellner, and F. Gould. 1998. A spatially explicit stochastic model demonstrates the feasibility of Wright’s shifting balance theory. Evolution 52:1834–1839. Coyne, J. A., M. Turelli, and N. H. Barton. 2000. Is Wright’s shifting balance process important in evolution? Evolution 54: 306-317. This entry was written by whyevolutionistrue and posted on March 9, 2019 at 10:30 am and filed under MOOC, science education, teaching evolution with tags MOOC, Sewall Wright. Bookmark the permalink. Follow any comments here with the RSS feed for this post. Post a comment or leave a trackback: Trackback URL. You will find out when you turn over the paper! 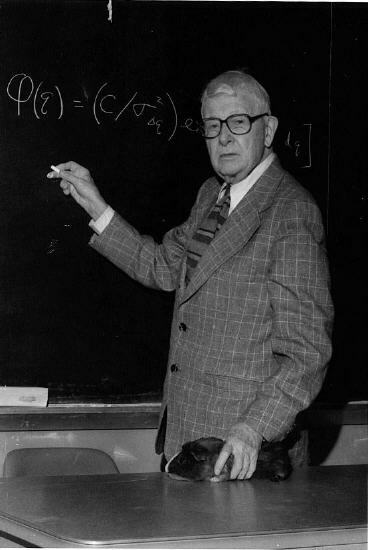 Judea Pearl in his book “The Book of Why: The New Science of Cause and Effect”, credits Sewall Wright with being “the first person to develop a mathematical method for answering causal questions from data, known as path diagrams”. I thought I remembered encountering SW in the causal modelling stuff somewhere! That’s where. Jerry, Greg: thanks for posting the references and pdf’s. Greg, it might be useful to stress that Wright’s “adaptive landscapes” refer to population fitness diagrams based on gene frequencies (that ignore what phenotypes are doing) and not on phenotypes and their biological/ecological functioning. Dawkins’ imagery of climbing “Mount Improbable,” polymorphisms with multiple “adaptive peaks”, and so forth are completely distinct. I was always amazed at how little Fisher, Haldane, and Wright actually knew about the natural history of plants and animals in the wild. Fisher, at least, seemed aware of this lacuna and discussed his ideas with field biologists, in particular entomologists. Thank you for posting this. You have expressed in the past that we don’t appreciate your science posts, but we do. I think fluctuations in population size may be an important factor in speciation as follows: In a small population, mildly harmful mutations can drift to fixation. Back to a large population, selection will “correct” that defect. But in isolated populations, both the mild defects and the correcting mutations may be different (and incompatible). Cycle through that a few times, and two isolated populations will have sets of mutations and fixes that don’t work together, producing the genetic isolation that defines species. Unfortunately, I am unable to fully absorb all the years of research and effort that went into the synthesis. I wish my capacity were greater. My best hope is that someone will write this science history up as a kind of “Double Helix” account. This website is responsible for filling a massive amount of shelf space with literature & countless hours of reading! “Dobzhansky, Genetics and the Origin of Species” and it is, as promised, a very stimulating read!